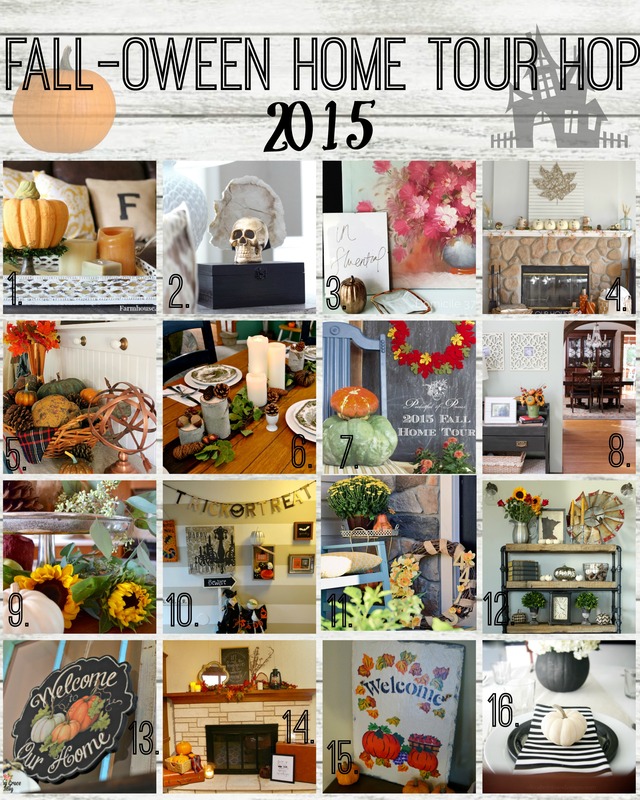 As if I haven’t posted enough fall-related decor posts, I’m starting this week with a “Fall–oween” Home Tour that I joined with 15 blogger friends. I feel so honored to be in the company of such talented women! Below is a preview of what you can expect from this tour. 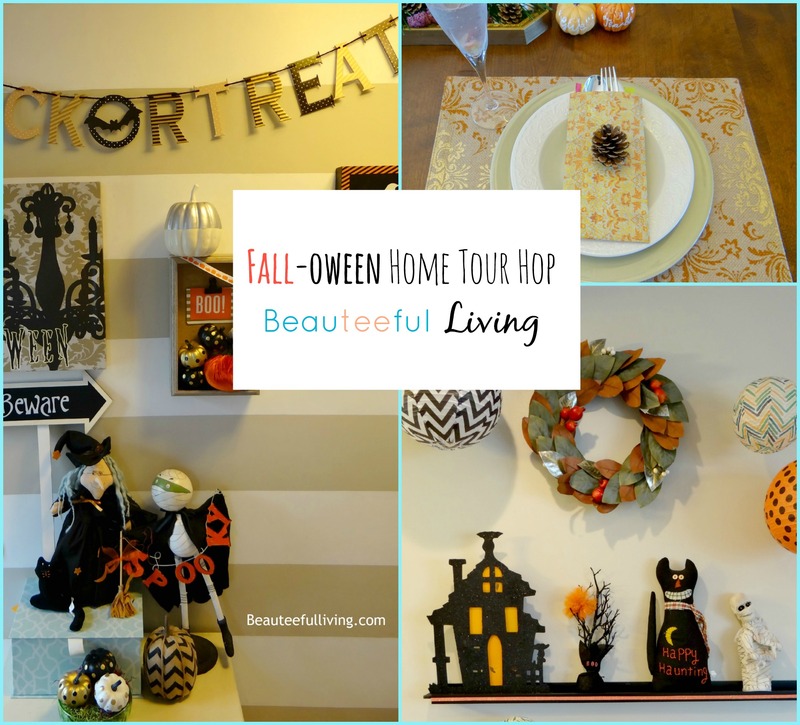 In this tour, as the title hints, you can expect to see a mix of Fall and Halloween-themed decor. If trick-or-treaters came to our front stoop today, they’d see this view. I just love the color of these mums! 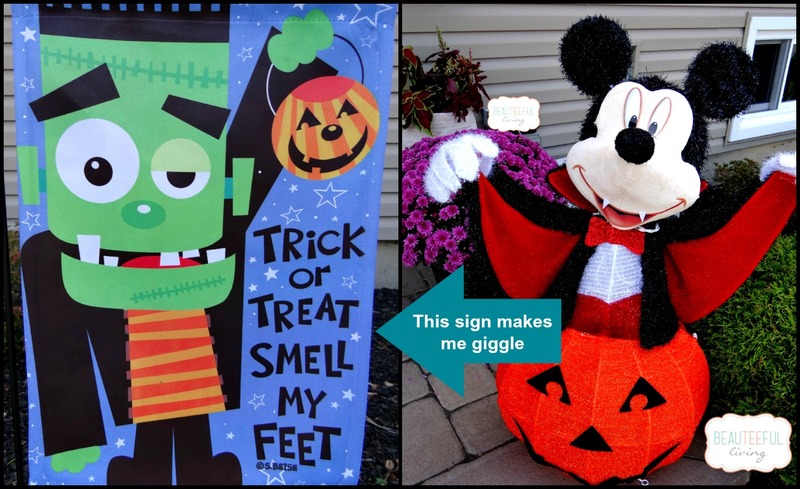 My Frankenstein mini-flag and Light-up Mickey figurine are back again this year! Don’t you love it when holiday decor lasts longer than 1 season? With young kids, I like to keep the Halloween decorating somewhat cutesy. My husband, on the other hand, would rather have skeletons, creepy creatures, and dangling monsters all about! 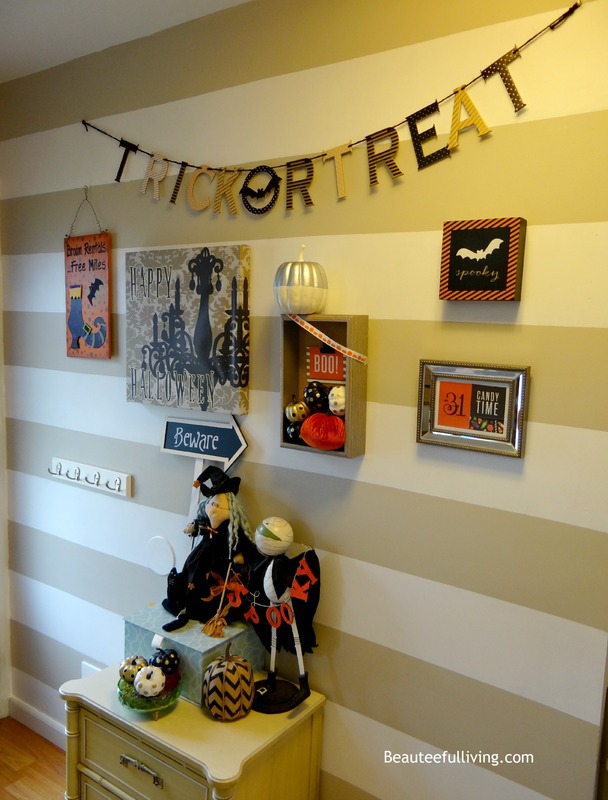 Heading inside you will walk through our small teeny foyer where I recently created a Halloween-themed gallery wall. I literally started decorating as soon as the paint dried! In case you missed last week’s post, you can catch it here and learn how I did this paint job in half the time! Walking a few steps up from our foyer, you’ll enter our living room area. On one of the walls, you’ll see 3 large-sized matted frames. 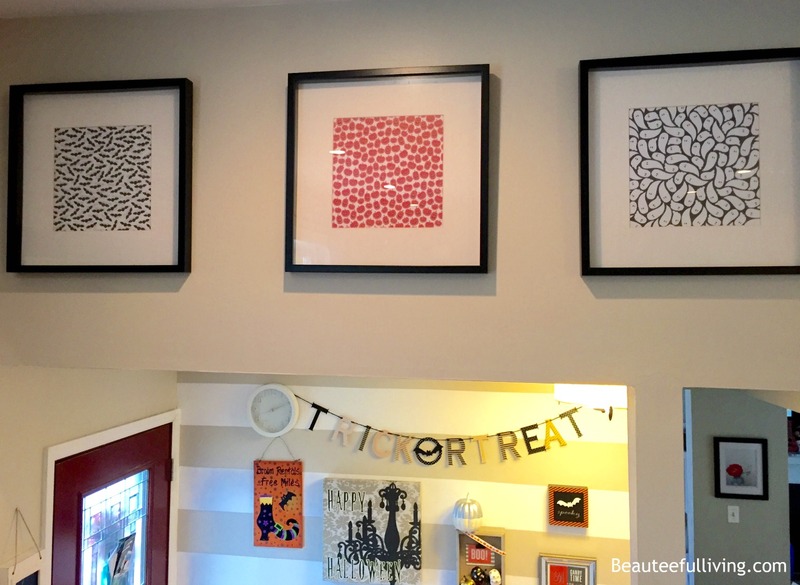 I swapped out my usual prints with these Halloween-themed prints below. 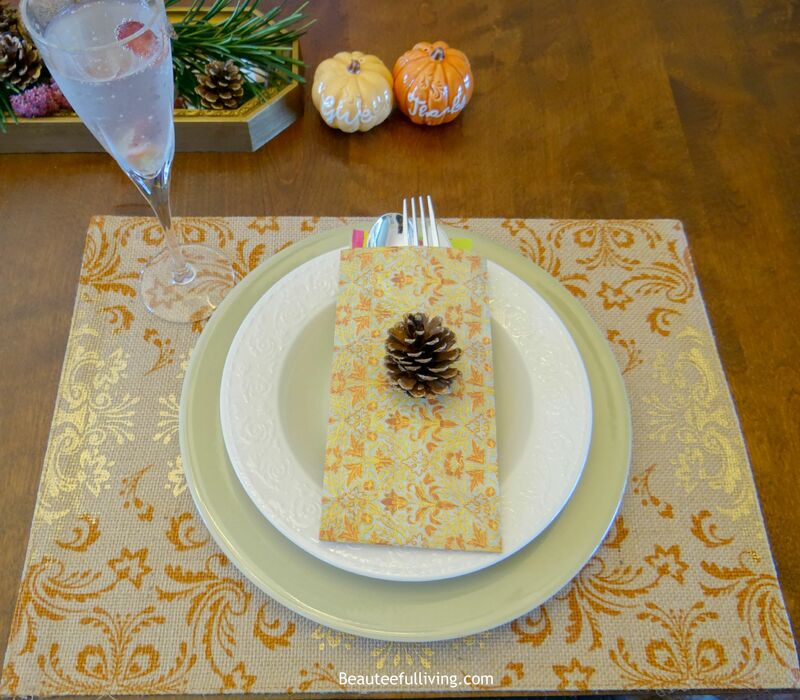 In our dining room, regular readers of this blog will recognize the “elegant” themed tablescape I recently created for the fall. You can catch the full post here if you missed it. A close up of the table setting. Still loving this centerpiece which consisted of branches from our pine tree and some flower buds from an outdoor plant. 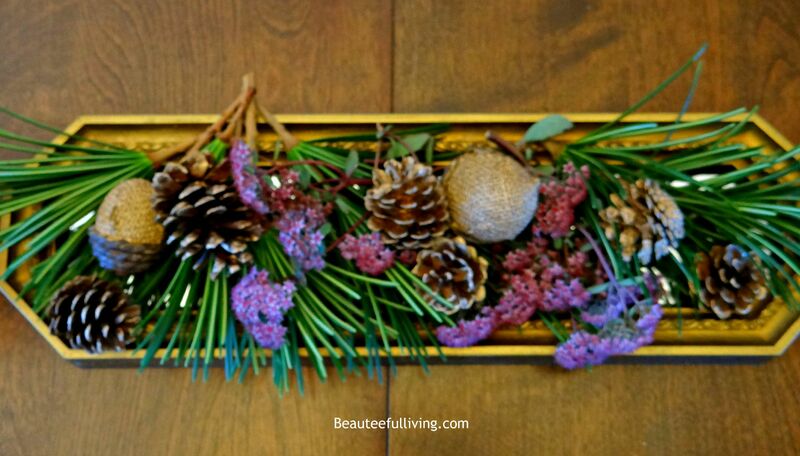 The acorns and pine cones came from a fall decor set I recently purchased. Rounding out my “fall-oween” tour is the Halloween display I did around our buffet table in our living room. This is actually a sneak peek at some of the party decorations I will be doing for my youngest who’s celebrating a birthday this month. She turns 5 and we’re throwing her a Halloween-themed party since Halloween lands on a Saturday this year! Cannot wait! Before you go, I’d love for you to check out posts from my blogger friends featured below! Links correspond to numbers on image. Hi, Tee ~ Your home looks so fun and festive! 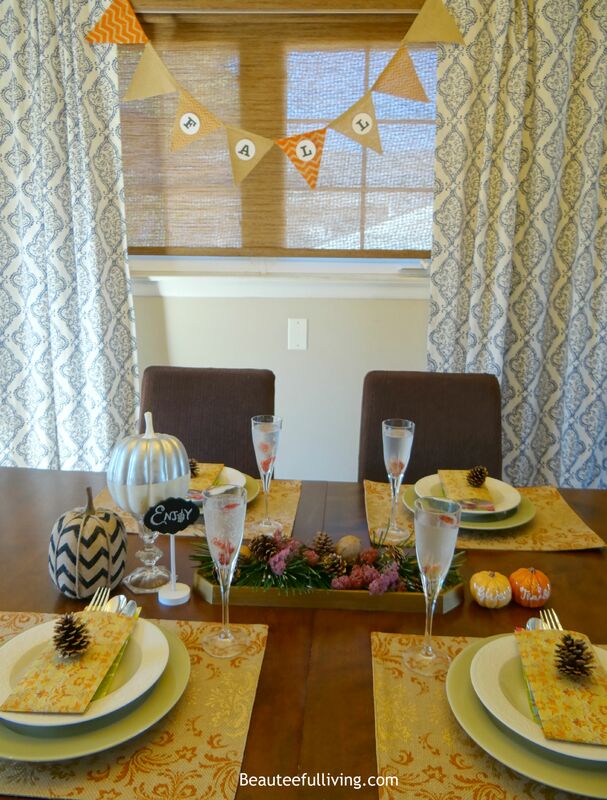 I love your fall tablescape, especially those lovely placemats! And the orange frame with the “trick or treat, smell my feet” image is adorable. Thanks for sharing! Tee you home looks so ready for Halloween! I love all the special touches and the pumpkins are adorable. Pinned it!!! Hi Stephanie! Thanks for commenting and pinning this post. It was fun doing this tour hop with you wonderful ladies! 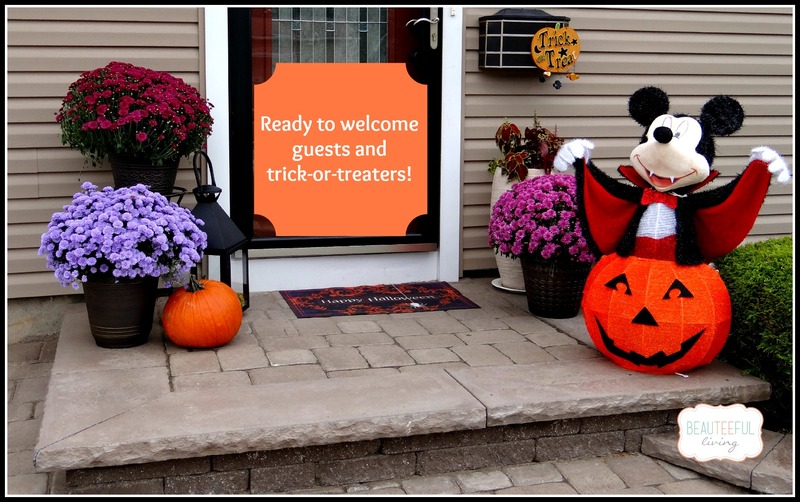 Your home is perfect for Halloween with little kids! And your dining room table is gorgeous! Beautiful job Tee! Those mums are so vibrant on your front porch. Thanks for sharing! So fun!!! I always love what you do with color and prints (I do not have that skill) and you didn’t disappoint! Tee what a great idea to swap our regular prints for some fun Halloween-themed ones! Your mums at the front of your house look amazing. I’ve never seen purple ones like that before! Hi Bre! I love those purple mums too :). Thanks for commenting. I bet trick-or-treaters love stopping by your house. So warm, inviting and fun! My favorite little detail is the orange frame with the witch boots. Whimiscal! Your home is so decorated in such a fun way! 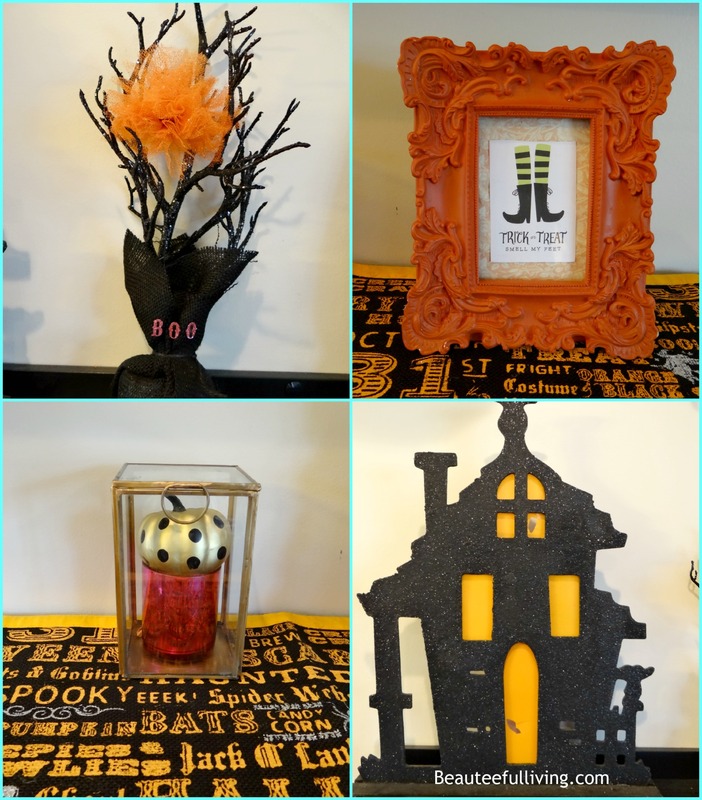 Love to see all of your Fall-oween decor! Thanks for stopping by and for the sweet compliment! What a beautiful home – your kitchen table set up is so dreamy! I love it! 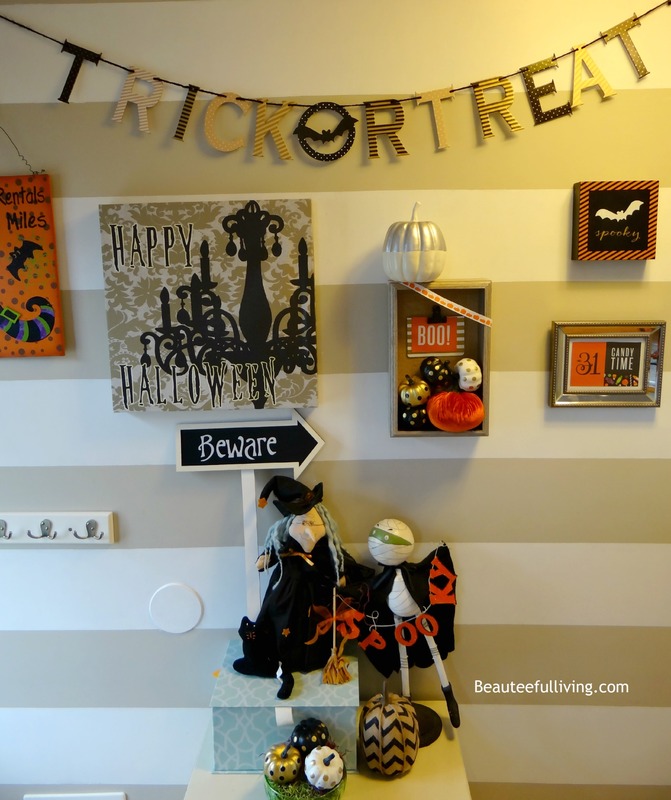 The entryway wall is so cute! 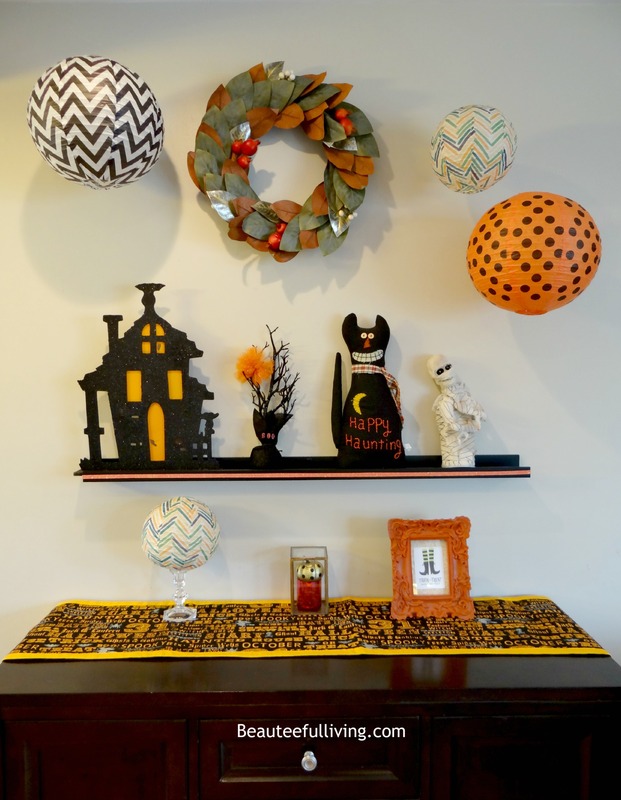 Your decorations works great for a family with young kids, I am sure your girls love it. You always have such nice touches to your home and decor. Thanks so much for the compliment, Emily! Nice Tee! I love all the whimsical little figurines and I bet the neighborhood kids love to stop by your home when they go Trick or Treating! love it!